I have been meaning to make this dish for a long time now. My mum used to make a similar version of this with chicken and also with beef. However her beef version uses a lot more pepper ..... black pepper to be precise! 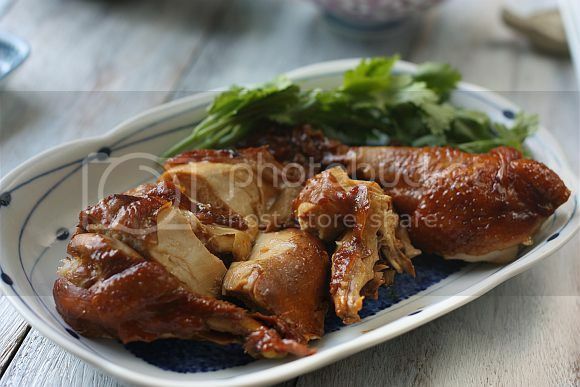 There is a eatery shop directly opposite Hong Lim Market which is well-known for their delicious soya sauce chicken. I used to frequent this shop when I was working around the corner many years ago. It's not a fancy eatery and the shop front seems to have "stood still" in time. 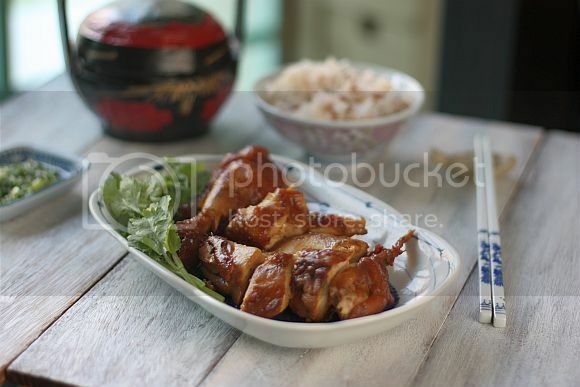 The soya sauce chicken dish is either accompanied with white rice or egg noodles. I was hoping that this recipe would come close to what this shop serves and how I remembered the dish's flavours. And I was not disappointed at all ... it is really, really close! Definitely a keeper's recipe and a dish that will be enjoyed by the whole family. 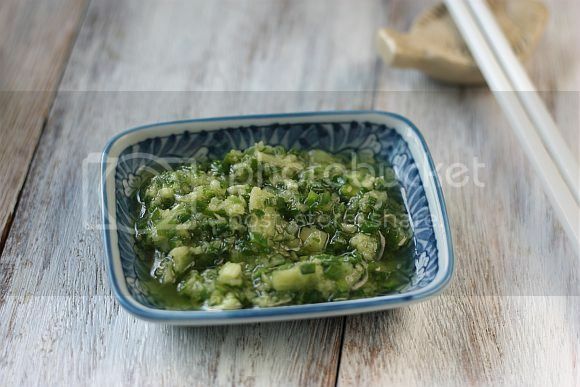 To prepare the ginger and scallion dip, place the ginger, salt and spring onion into a small bowl. Heat up 2 tablespoons of oil in a frying pan until it becomes really hot and starts to smoke. Pour the oil into the small bowl and stir until everything is combined. Be careful as the oil may splatter slightly when it touches the ginger mix. 1) Add all ingredients (except the chicken) into a deep pot and bring it to a boil on high heat for 15 minutes. Add the chicken halfs into the pot and boil over high heat for about 10 minutes. Lower the heat to simmer for 30 minutes. 2) Then turn off the heat and let the chicken soak in the sauce until it has completely cooled. 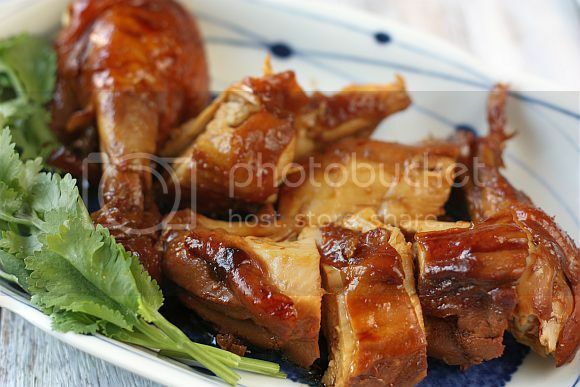 Chop the chicken up into bite size serving pieces. Place onto plate. Pour the sauce into a separate bowl to be served together with the dip. 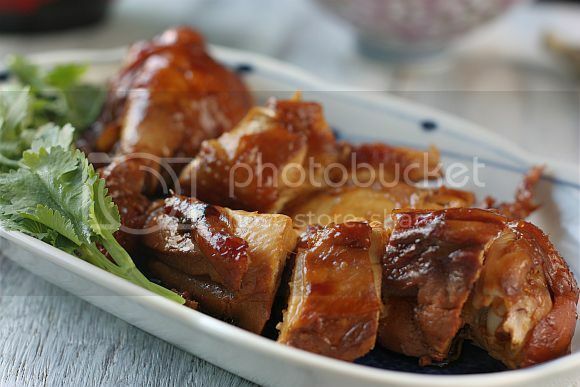 This dish is usually served at room temperature together with hot steaming bowl of rice. Any left over sauce can be kept for other dishes such as soya sauce eggs. Add a few hard-boiled eggs into the sauce and let it sit overnight in the fridge. 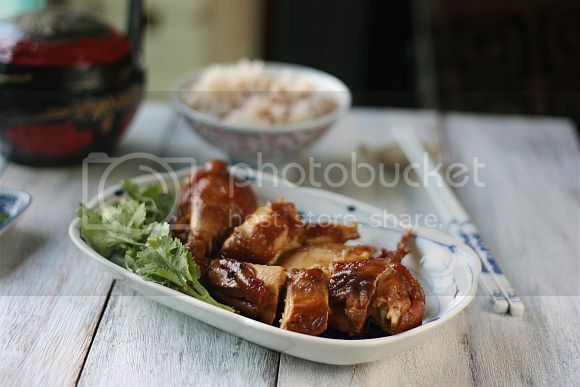 Alternatively you can use it as a marinade over deep fried beancurd. Yum! This is my family's favourite dish. This looks delish! Love the dip a lot. Jo if I am not wrong you are talking about the same shop that I frequent all the time when I was young. Totally delish and now I can make them at home. Thanks so much. !